The magnificent hilltop city of Toledo, about 43 miles (70km) southwest of Madrid, was immortalised by Spain's renowned artistic genius El Greco in a cityscape that currently hangs in the Metropolitan Museum of Art in New York. The city has changed little since El Greco captured it on canvas in 1597, with its golden spires and Gothic buildings spreading across the Tagus River Gorge, overlooking the plains of New Castille. Toledo was established by the Romans in about 192 BC and some Roman ruins are still visible outside the city walls. The ancient city was later the capital of Visigoth Spain in the 5th and 6th centuries and as time passed Muslim, Jewish and Christian communities all left their mark on the city's rich architectural heritage, from the Moorish gate (Puerta de Bisagrai), to the Gothic convent of San Juan de los Reyes. 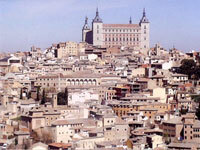 Toledo is a UNESCO World Heritage Site because of all these wonderful cultural attractions throughout the city. Pride of place is held by El Greco's 'Burial of the Count of Orgaz', painted on the wall of the Santo Tome. The town's attractions and main street are packed with tourists throughout the summer, but it is easy to escape into one of the enchanting side streets, which wind up and down the hillside.